Everyone MUNI rider knows that the system needs improved maintenance and more money for its stations, tracks, and cars. Politicians pay lip service to giving MUNI the money it needs, but continually siphon off money voters thought was going to MUNI to pay for the projects of politically powerful constituents. This election the Mayor and Supervisors are again asking the voters to increase taxes to fund a bond measure to save MUNI. Except that much of the money in the bond does not go to MUNI. 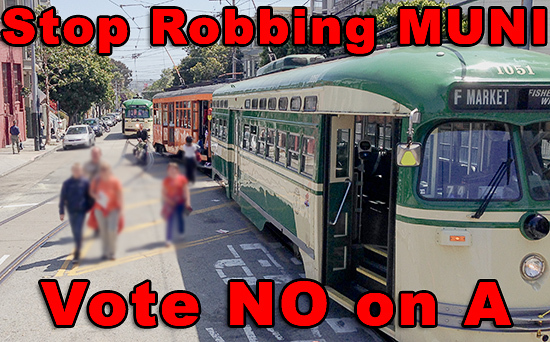 They’re robbing MUNI of the money it needs in order to pacify the insatiable bicycle coalition and other special interests. Money goes to “Invest in development of critical capital projects along key transit corridors”… whatever that means. Some of the non MUNI goals of Prop A are ones that I support. I believe in steps to “improve pedestrian safety through focused engineering efforts at high-injury locations”. But, none of these goodies belong in a bond issue being sold to improve MUNI. Some of other uses of Prop A money i do not support. I do not think we need to spend more money on more bikeways before we fix MUNI. But,even if you think we need more bikeways, I don’t believe they should be funded by a proposition being sold to the voters as fixing MUNI. I will vote for a bond that dedicates its funds improvement to MUNI. But, please Mr. Mayor and Mr. and Ms. Supervisors, give me a bond issue that actually gives MUNI all the money you’re asking me for. This entry was posted in Politics and tagged MUNI, Prop A, San Francisco ballot issues. Bookmark the permalink.